The Manley Variable Mu Limiter Compressor has been Manley's best selling product for many years. It is one of the very few compressors that have become a real standard in mastering studios and contributed to most hit records over the last decade-and probably the next. "Mu" is tube-speak for gain. It works by using the "remote cut-off" or re-biasing of a vacuum tube to achieve compression. The highly revered vintage Fairchild 670 also uses this technique, and is one of few all-tube compressors to do so. Even the side-chain has glowing rectifier bottles. How's it work? The unique 5670 dual triode is at the center of the peak-reduction and compression action constantly being re-biased by the vacuum tube rectified side-chain control voltages, which cause this tube to smoothly change its gain. Just like that. The Compress mode is a soft-knee 1.5:1 ratio, while the sharper knee Limit mode starts at 4:1 and moves to a more dramatic ratio of 20:1 when limiting over 12dB. Interestingly, the knee actually softens as more limiting is used. Distortion can be creatively used by turning up the Input and turning down the Output while using very little or no compression. High-Pass Side Chain option: Also available on the mastering version of the Variable Mu (#620909), this adds two switches to the front panel, one for each channel, so that when engaged, the side chain will not respond to frequencies lower than 100Hz. (100Hz is standard as the -3dB point. Other frequencies can be custom-ordered.) This HP SC Mod can be used with music with heavy bass lines or bass-heavy mixes where you don't want the bass driving the whole action of the compressor. The filter is a very gentle 6db per octave 1 pole filter, and will typically be down 1-3db at 100 Hz, and down 4-6db at 50Hz. As you decrease the frequency the amount of limiting will decrease also. At the extreme LF (<20hz) there should be very little gain reduction going on. The purpose of the filter is to keep very LF stuff (like a heavy kick drum) from activating the compression/limiting so that the overall level doesn't duck with every drumbeat. Note: There is no space to add both the M-S and High-Pass mods. You must choose one or the other. T-Bar mod: This modification is in response to users wanting to know if they should use the 5670 tubes or 6386 tubes. With the poor availability of the original USA GE 6386 tubes, newer Variable Mu Limiter Compressors use the 5670s. Do the 5670s sound different? Well, up to about 6db of limiting it's about the same. After that point, the 5670 version tends to sound more "squashed" than the original 6386 version. Some like it better, some don't-depends on what you're trying to do. To solve all these problems, Manley came up with a really good solution: the T-Bar Mod, which uses a pair of 6BA6 pentodes wired as single triodes to replace each dual triode 5670 (or 6386). The 6BA6 T-BAR Mod is the preferred system to use in the Manley Variable Mu for the ability to perfectly match each phase-halve section and each stereo set; ability to select for lo-noise and lo-microphonic sets for a low cost; and because the action of the 6BA6's so closely resemble the smooth 6386 limiting curves. Which Manley Limiter Should I Buy? 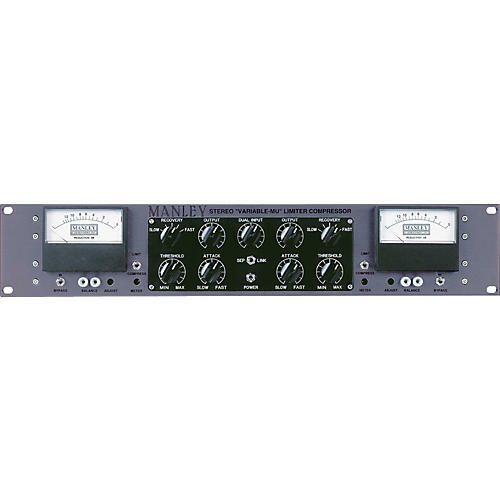 Along with the Variable Mu, Manley makes a number of compressor/limiters including the ELOP (#620914), SLAM (#620610-13), VOXBOX (#620884), Langevin Stereo ELOP (#620918), and Langevin Dual Vocal Combo (#620915). The most commonly heard questions are, "Which compressor should I buy?" "Do they all sound the same?" And "will the one I buy do everything I need it to do?" The answer is that each unit sounds different, but those differences may be more subtle than dramatic. The differences rest mainly in how the gain reduction is done and most importantly, how you intend to use them. The Variable Mu is largely intended for mixed tracks where a few dB of smooth and gentle compression is desirable. It does excel at introducing a tasteful amount of color or character depending on Input and Output Level settings. It is usually at a disadvantage when used for deeper than 6dB of gain reduction, or if really fast attack and release times would be a better call. So it might be considered a sweet and gentle "color box" more than a textbook dynamics processor. Those who understand this tend to love the box. Those who try to make it "pump," "get aggressive," or distort like a guitar pedal, tend to be less satisfied. Of course, many do use it for adding a little something special on vocal and guitar tracks. The Variable Mu will do a lot of things extremely well, but no one dynamics processors will pull off every trick in the book. The Variable Mu is more of a "color-box" to add a subtle richness and vibe. The word "glue" is perhaps the most appropriate word to describe the Variable Mu's effect on a mix. It makes that record sound "like a real record" cohesive and balanced.